Authentic international bites in casual spots. This post is about some casual places where you get authentic cuisine: Japanese, Mexican & South Indian. The ambiance and decor are not the protagonists here, just flavors & spices. Perfect to go with kids during the holidays. Yatai, Japanese restaurant serving authentic cuisine. No sushis here but savorous dishes, served in this Japanese tavern. 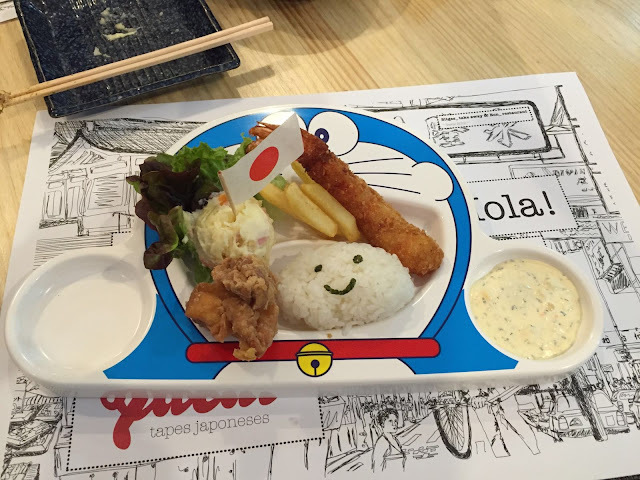 They also serve Doraimon themed dishes. On Calle Comte D'Urgell 112. Tel: 93 532 64 56 Closed On Tuedays. Korokke ; japanese curry with a vegetarian croquette. La Gastro Taqueria, serves delicious Mexican dishes and drinks. They have vegan & vegetarian options for all their dishes. On Calle Paris 38. Tel: 936 24 08 27. Closed on Monday. Just opened, Chenai Masala Dosa serves authentic south Indian cuisine.